Note from JL Naudin : These emails below has been sent to me by James L B Bailey and give some interesting details about the Schauberger's Repulsin. All these informations are published freely on this page with courtesy of the James L B Bailey and under his responsability. Disclaimer from JL Naudin : I assume no liability for any incidental, consequential or other liability from the use of this information. All risks and damages, incidental or otherwise, arising from the use or misuse of the information contained herein are entirely the responsibility of the user. Although careful precaution has been taken in the preparation of this material, I assume no responsibility for omissions or errors in the diagrams or measurement datas published here. I have a point to make sir on you fabulous web sight. I attended several universities in Texas,USA. My own "UFO" research can be found in Electric Spacecraft Journal #29. It refers to a pyromagnetic air craft engine. This engine being developed by me allows dynamic turbulence in the atmosphere to alternately magnetize and de-magnetize a ferromagnetic shell causing a pressure and vacuum pumping effect that in turn powers and propels the vehicle. The research is proven and effective as a means of advanced space propulsion. I refer you to the physics of thermo magnetism. The hull essentially is a giant "TRANSFORMER" powered off of changes in external and internal air pressure which drive by peripheral jet ports the defined thermo magnetic compression plate. The device can have a thermo magnetic resonation disc on top or bottom and still function properly. One cylindrical device has a thermomagnetic oscillating plate on each end and demonstrates a rocking motion. That is my research derived from thirty years of university study in engineering and physics. The correction to your "REPULSINE" article is as follows. The "REPULSINE" uses a cold water injection between the bottom plates that alternately expands and contracts the air input by the principle of thermodynamics as can be found between a cold water reservoir and hot desert air. There exists in Channel view,Texas a water pump using this exact same effect. The 200 gallon tank has a hot air intake valve on top and withdraws periodically warm air from the surrounding atmosphere. At the tanks base is a single shallow well water pipe which brings cold water into the tank. This effect is simple to demonstrate. The tank begins to rock on a central fulcrum and expels water from a long pipe centrifugally attached to one end of the tank. This oscillating pipe maintains a back pressure that prevents water being pumped out to be drawn back inside the tank. Every 30 seconds a new volume of hot external atmosphere is drawn into the tank and imploded. This causes a remarkable increase in the tanks oscillation. The oscillation is do to the intake water supplies uneven internal distribution. In effect the tank is gravity powered. The "REPULSINE" uses the same phenomena. Cold water drawn through a base hose is spun in between the two wavy empellers and cools the air inside the Repulsine shell. As the air is drawn in by this partial vacuum it is spun into a cyclone by intake fins. After the air is cooled and humidified it then still spinning is expelled from an upper turbine that reacts with the exiting cyclone. This centrifugal air has so much angular momentum that it is able to leave the Repulsine even against a strong internal vacuum. That is a direct analogy to the rocking tank implosion based water pump I have already described. I am building and have tested in smaller sizes a 22 inch "REPULSINE" from a steel shell. Remember the power source is the Thermal difference between cold ground water and hot dry desert air. Just as is done in the implosion tank rocking water pump. There is no mystery here . This device does nothing but convert the energy present in the combination of cold ground water with hot dry atmosphere. Calculation of intake 120 degree F intake air volume in cubic feet per second and intake 60 degree F water in gallons per minute,yields the maximum energy gain. The motor is only used to start the implosion cyclone. That Sir is how it actually works. In many ways it is similar to Schauberger's water turbine which does also use a pulsed pressure reservoir. I have worked extensively on both designs. Keep in mind without the cold water input the pulsating vacuum trapped inside the "REPULSINE" soon diminishes and stops. There is a lot of mystery behind this device. I hope I cleared up a point or two for your web readers. THANK YOU!!! I realize how busy you are with other research so I am always gratified some one cared enough to write me back. There are millions or at least hundreds of thousands of individuals working on theses projects in there spare time. some of us are at the cutting edge of theoretical development and others possessing no formal education willfully mislead about certain laws of thermodynamics. Yes there are exceptions to every rule. Sometimes however you haft to go with the fellow who has actually succeeded and avoid the ones making undemonstrated claims and even asking for peoples precious life savings. Allow me to quote verbatim.....Schauberger said " I connected the implosion motor to an out door water tap and it began to spin and finally took off "............."powered off of nothing more then ordinary cold tap water"
Sir, that is what I remembered the article in an obscure book saying. The book is now lost to me. I searched my files for many hours. That requires us in all fairness to obtain independent verification. If you look at the "REPULSINE" you will find a water pipe beneath it sticking out to the side. Schauberger was a master of water implosion technology. I have studied him for over twenty years. It is possible to "COOL" air by simply pulling on a piston, but you require work to do that. At the same time if you compress air in a piston it will get "HOT". That requires also force over a distance or mechanical work to accomplish. You see Sir, there is no "GAIN"!!!! Simply expanding a piston and contracting it(or a vortex) accomplishes little more then creating a spring. We all know springs eventually stop bouncing. Schauberger's expanding and contracting tornado also eventually ceases without an energy source. Recall the Hilsch-Rankine tube or Maxwell's demon. The tube generates a spiral air flow and creates hot air in the large tube and cold air -140F in the small diameter tube. Sir in order to accomplish this "COMPRESSED AIR" in large volumes must be used up in its ability to do work. No free ride there. It is possible to make a vertical tube howl like a banshee,but the second the flame is removed from the tubes inside wall the resonance stops. Again it requires a defined energy source. I studied Nuclear Engineering at T A&M and physics and general science at several other universities including University of Houston,Rice, HBU and Southwestern University (all Texas,USA campuses). I was unable to complete final degree work for reasons beyond my control. My background therefore is part conventional and part un-conventional. I do know the correct answer when I see it. My own research in convection based pyromagnetic aircraft and almost thirty years of personal wind energy design focused me on Viktor Schauberger's "REPULSINE" and water turbine. Yes I understand cold fusion was believed to be involved in his famous enclosed water turbine(not the Repulsine). Sir, I have done years of experiments with devices of this nature.The answer is and always has been in the rapid contraction of hot air inside a cold water vortex. That is Viktor Schauberger's secret. Yes the cat is most definitely out of the bag!!! Consider carefully. When the rams horn arm of Viktor's water turbine approaches a valley (serrated ring at circumference of his turbine).Warm chamber air is drawn inside the forming vortex pocket(that air is warm do to natural convection currents, low density hot at top of chamber,high density cold at the chamber's bottom). Now here is the earth shaker as my physics proff. at SWU at G. would say. As the now warm pocket of air drawn into rams horn arm tip approaches a "HILL" along the serrated edge it closes the mouth of the rams horn vortex. This collapses the air bubble since the water is cold in the arm(drawn from the cold basins bottom) and pulls the arm toward the hill by a low pressure suction. Now our induced vortex bubble is smaller and only cold air. It must be released with the secondary spray issuing out the v-slot in the rams horn tip. We have used the mechanical energy of the condensing warm air vortex bubble. The vortex also loses cohesion because its base flow is blocked and this further assists the removal of water (pharaoh's pump effect). Now our rams horn inside Viktor's water turbine swings to a new valley rim serration and a new warm air pocket forms and the implosion process starts all over again. The water turbine must absorb heat in this manner or stop spinning. The usefulness of a collapsed cooled vortex bubble is "FINITE". That is why his rim is serrated. That is also why it appears to rotate in reverse(recall the egg in the bottle experiment). So where does Viktor get his energy??? It comes from natural thermal stratification found in any sun warmed room that sits atop cold ground water. Nature constantly restores this balance. The basin water is denser then air and very cold at the bottom do to convection cells in his basin. That is the very water we draw up to operate his implosion arms. The upper room air is warm(also do to convection currents). The heat conducts into his shell easily. That is Viktor's thermodynamic water and air secret. You can repeat the egg in the milk bottle experiment any time to see the suction involved. So we have a "REPULSINE" I have worked for years perfecting pyromagnetic convection aircraft engines. These engines directly convert the momentum in an updraft into usable mechanical energy. In my device spoken off in ESJ # 29. I use the air drawn out dozens of peripheral holes(as in a flute) to induce a cold air intake flow across a chamber. This cold air is able to cool the magnetized plate and draw it closer together. Once the plate is collapsed it begins to heat(many reasons). This is similar to a duck call or Clarinet mouth piece. When the plate closes and heats(do to restricted air flow) it de-magnetizes and is sprung away . After that the plate is once more freely cooled by the peripheral flow ports and has its central intake fully open,it now begins to magnetize and once more compress and close the gap between the magnetized flow plates on the devices base or top or sides. In effect Sir we have created a pyromagnetic air pump that can propel an atmospheric vehicle to great speeds(secret of all Government UFO's). I mention this not to plug my own research "ONLY to parallel it with Viktor Schauberger's "REPULSINE". Atmospheric energy extraction is simply what I am most interested in. My device "MUST" employ a very strong magnetic field and also has a homopolar dynamo effect if the pyromagnetic chamber is spun by perpendicular exhaust ports. If you remove the magnetic field the pyromagnetic heat conversion ends and it stops working. Viktor's device had a diamagnetic field do to the effect one he noticed when sand is dragged along a stream bead and gives off piezio electric sparks. He was a most amazing man. A water sand slurry was best for that charging effect according to him. The "REPULSINE" I have worked on uses a cold water pipe to cool air in its chamber. But it is not absolutely required after spin up. The shell becomes very hot as air is compressed from induced vertical updrafts surrounding the Repulsine. This vortex that forms above the Repulsine maintains its suction and continuos to intake large quantities of atmosphere that are then cooled at the small base intake hole's internal cyclone. In effect the "REPULSINE" like Maxwell's demon separates the hot and cold air by conversion of external updraft momentum and uses it to draw more air flow to the "REPULSINE". My own pyromagnetic convection aircraft engines seek to do the same. That is Sir we are attempting to enhance a natural convection cell around the aircraft. Sailplanes are passive convection cell user's.....Viktor's marvelous machine is active!!!!!! feeding back heat to enhance its own updraft. Where does the heat come from??? Sir, it is impossible to alter natural vertical flow without generating heat. That is simple momentum conversion. The heat its self. SO SIMPLE !!! It comes from the HILSCH-RANKINE tube effect!!!!!!! The shell gets very hot as the inside cools and implodes and the outside edge heats . You are actually pushing great quantities of air into the "REPULSINE" ,as well as forming a suction above it. That is known as the fire storm effect. If you want to generate an updraft in a chimney you "MUST" warm it. The outer shell becomes very hot. The inside center cold. This creates a resonating flow effect. If this "REPULSINE" did not oscillate between high and low pressure it would not intake as much air. That air can by centrifugal compression at the shells rim be directly converted into heat to maintain the effect. AGAIN ,I REPEAT !!! look at the Hilsch-Rankine tube!!!!! Same exact effect. The mechanical flow of the external air (driven by natural solar convection currents) is a direct analogy to the compressed air used to drive the Hilsch-Rankine tube. NO! NO! NO! the "REPULSINE" is not internally powered. It is driven by external flow that is subducted into its internal cyclone and generates a hot and cold region just as the Hilsch-Rankine tube does. The water and 1/20 th horsepower motor is only used to start it....PERIOD. I know that is a lot to grasp. Viktor was probably one of the smartest men that ever lived. It took me years to make the smallest discoveries in relation to his work. Most of that time wasted from lack of feedback from other researchers. This is a work in progress. My research is limited do to liability concerns. I cannot go out into the area I live in and start generating implosion cells as Viktor did. I am very close to three airports on a lake in Northern Oklahoma.One is a certified large aircraft runway,another a small grass field, another an amphibious runway....I must work in enclosed buildings. For the longest time I have endeavored to construct a vertical flow wind tunnel. Be mindful of what I have told you about his water turbine and "REPULSINE" it is all very easily verified. Remember the "REPULSINE" uses an internal coolant and motor to start(1/20th horsepower) and "EXTERNAL" convection cells drawn into his base intake,power his heat and cold producing and updraft enhancing cyclone. Our work is very similar. The water turbine is powered off of those milk bottle and the egg experiment warm air condensation pockets trapped inside his rams horn arms,it is also powered by the atmosphere and convection cells from thermal density stratums naturally present in a warm room over cold ground water only "PASSIVELY". The "REPULSINE" is far more dynamic and dangerous to experiment with. BE VERY CAREFUL!!!! As far as photos and video tapes. First I want to discuss theory and the inherent hazards in building these devices. It is absolutely stupid to confine air in a chamber under centrifugal or static pressure with out a certified mechanical engineer to test and verify the pressure vessel you are experimenting with(water turbine & Repulsine). SEEK OUT A MECHANICAL ENGINEER BEFORE ENGAGING IN THESE EXPERIMENTS OR THEY CAN AND WILL CAUSE SERIOUS INJURY OR DEATH!!!!! One I am certain you are aware of the way a smoke ring is created .In a physics lecture the professor will place a solid wooden box on a table and behind it a strong rubber diaphragm. In the front and middle is an aperture that induces the smoke ring.This apparatus is found in "Physics Demonstration Experiments" volumes 1 & 2...Its a tan hard cover. very large books. Another term is Hemholtz ring. Sir, this ring has very important significance to the "REPULSINE", it is yet another sign of Viktor's genius. What is a smoke ring??? It is a puff of swirling vortex created as air is forcefully driven from a hole and creates a low pressure torus at its center holding the external vortex into a coherent unit. That in effect is a type of flywheel. Now, "EXACTLY" why does Viktor use those concentric rings. This has caused far to much speculation over the years. The center of Viktor's "REPULSINE" is a hole at the bottom that admits the hot rising desert air induced from the external updraft formed around the "REPULSINE" when in operation. The Malmo group people have shown this for years in there diagrams. There web sight is a very useful research tool. Seeing this base hole in a diagram, we now must understand its purpose. Sir at this time if we simply spun a centrifugal turbine in the base of our "REPULSINE" it will heat up at the rim shell. That is do to compression of air and is agreed upon by engineers the world over. Viktor went a step further in order to remove the turbulence. He did a rather brilliant thing. He induced by all of the concentric plates a "SMOKE RING" or "HEMHOLTZ" ring. In simple terms the air enters the "REPULSINE" as a large smoke ring. We must be careful here . The end result is that that smoke ring snakes around inside the concentric plates and becomes smaller and smaller in its toroidial diameter. That is the measure of the rings smallest diameter,not the measure of the entire ring only the "THICKNESS" of the smoke ring. In my own pyromagnetic apparatus these rings are blown in at the center and assist the magnetic plates oscillation as they spread out. Think of a pebble disturbing a quiet pond. Viktor often used natural examples. As the smoke ring spreads out trapped between those wavy rings. (use the pond splash analogy). The ring becomes extremely small in its smallest diameter. Viktor said from the beginning if you want to generate heat you must "Compress a vortex" . I realize it is called an implosion motor. It does implode atmosphere but the purpose is not what people think. The purpose is similar to a hard thrown base ball. You are throwing these smoke rings at the walls of the "REPULSINE"...as these "CONDENSED" smoke rings strike the inside of the outer shell. They deliver great heat. That heat then contributes to the external updraft that drives by suction the top exhaust propeller. The one with the curved blades,which in turn rotates the bottom intake smoke ring accelerator. There is nothing new here. We take in one at a time these rings of spinning air(artillery pieces produce them every day at military bases). That wavy plate pushes the ring to the outer shell and condenses it so that it heats by contracting it smaller and smaller. If we did not do this our "REPULSINE" would be less efficient. Each torus or ring of spinning air is in fact a small flywheel containing great energy. As that flywheel strikes the outer shell(this is all internal physics, I am not referring to any external air flow effect). The ring is destroyed and liberates great heat. In a physics lecture demonstration there is always a doubter. It is recommended for the "REPULSINE" experimenter to build a simple smoke ring chamber as listed in the "Physics Demonstration Experiments" text. Sir, you will find that a smoke ring(it actually requires no smoke and is a lay term) can transport a large quantity of energy. You can at several feet distance knock over cups and put out candles. This occurs after the boxes diaphragm is struck with a mallet. 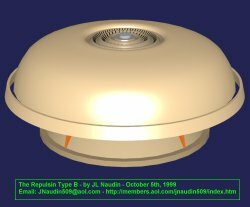 So the purpose of those wavy discs in the base of our "REPULSINE" is and has always been to accelerate intake formed smoke rings. As they expand to the rim they contract forcefully and gain definition. They then impact the inner wall of the outer shell, heating it enough to induce a strong external updraft (as does a campfire). This feeds back still more energy to the upper exhaust turbine that is assisted by a rising dust devil formed above the "REPULSINE"
Why go to all of this trouble??? remember I am telling you things that only Viktor knew and I discovered over thirty years of experimentation. It is because Victor never uses an inefficient technique. A simple centrifugal plate as is seen on tank type vacuum cleaner chops the intake air into a million pieces. By retaining the coherence of the intake air(remember this is an inverse ring effect as if using the physics demonstration ring box in reverse). Viktor gains the maximum energy release from his rings as they strike the inner wall and deliver there heat load as the ring is destroyed. A simple centrifugal compressor plate destroys the entering smoke ring shape. This causes turbulence and interferes with additional intake flow. Viktor takes in one vortex or smoke ring at a time. This orderly process insures and endless procession of rings into his implosion shell. Yes it pulsates as each new ring is formed. The main point is that it is very orderly. It interacts only in the most stable way with the wavy or vortex ring accelerator plates. The wavy plates in effect spread and contract into a very small thickness diameter the entering ring. It looks like a wave spreading in a pond after a stone is thrown into the middle. A final time, the purpose of those discs is to take the intake vortex rings and contract them so there thickness is reduced and increase there overall diameter until they strike the shell wall and liberate like a flywheel a great deal of heat that feeds the external updraft or firestorm effect(dust devil is another way of looking at it). Let me put it another way. This is difficult fluid dynamics to explain. Sir, recall in a previous letter I mentioned Viktor cooled warm air in his water turbine arm to contract the vortex bubble against a serrated "HILL" on its rim. That transferred heat to the water vortex leaving the ram horn arm. It is no different in the "REPULSINE" case . In this case the vortex is in the form of a ring instead of a long finger as in the water turbine spray arm. The vortex begins to "COOL" inside the "REPULSINE" and contracts its tornado shell around it as its thickness diameter decreases rapidly. That increases the speed of the ring vortex itself. This liberates a great deal of heat to the shell. One more time. I know how difficult this is to understand. If we use the brilliant research of the Pharaoh's pump group(they have an excellent web sight). We find that water can spin around a core of air until it reaches a great depth. Then the spinning water is destroyed and the air inside is highly compressed. For those Cecil B. Demill lovers. Think of the Pharaoh's chariots in the "ten commandments". Pharaoh ordered his chariots to pursue the slaves following Moses across the divided waters. As the chariots of Pharaoh approached the center of the water divide Moses asked God to collapse the water. ....This drowned Pharaoh's charioteer's. Pharaoh's water pump surrounds air with a vortex and drops it to a lower elevation and then like those drowned chariot drivers collapses the water vortex around the air and liberates it as compressed air. Study this carefully. Viktor's Repulsine does the same thing. The intake smoke ring contracts do to its own cooling . Place a "HOT" smoke ring into cold air(as is found inside Viktors implosion motor). That ring will begin to contract but as it contracts it "INCREASES" its rotation velocity. That in turn increases its impact energy at the shell wall. Allow me to say this again!!! Viktor intakes a large vortex ring that is composed of hot swirling air. That ring is cooled inside the implosion motor by the contraction discs or wavy discs. As the ring is cooled it shrinks in its smallest diameter or thickness which greatly increases its toroidial rotation velocity or vortex ring tornado velocity. Now the ring widens in its overall diameter and strikes the "REPULSINE" shell wall with great energy. Remember velocity equates to friction. A supersonic jet has very hot skin from air friction (hundreds of degrees F). So Viktors implosion motor literally intakes little ring tornadoes that cool inside his wavy disc chamber and therefore contract and spin even faster perpendicular to there toroidial center circle line One final miserable time!!! The Malmo group did a fine job of explaining it I am attempting to show the thermodynamics involved. 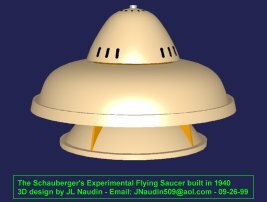 The Schauberger "REPULSINE" literally "EATS" little baby tornado rings and uses there high velocity to generate internal hull friction which assists the external updraft. There is always a doubter in the audience. All right Sir, how exactly do we make a tornado in nature!!!!!!!!!! First we bring cold air from Canada ( I live directly in Tornado alley). Then we bring up warm gulf air. The warm gulf air collides with the cool Canadian or Arctic air. The warm gulf air is "NOW" sandwiched inside a rolling column of cold arctic air. This causes the internal warm air to contract violently as the heat exchanges from the interaction of the surrounding cold arctic air. We now have a dangerous energy sandwich. The internal trapped gulf warm air quickly contracts as it liberates heat to the surrounding cold arctic air vortex(recall the water turbine arm). This greatly accelerates the vortex velocity. Remember as an ice ballerina pulls in her arms she spins much faster. That requires mechanical force (in her case muscle) that force is a direct resultant of the thermo mechanical internal air contraction do to rapid cooling. WE NOW HAVE A CONTRACTED AND VERY DANGEROUS 200 TO 500 MILE PER HOUR TORNADO!!!!!!!!! Viktor does the exact same thing in both his "REPULSINE" and water turbine. In the implosion motor it takes the form of a ring vortex spreading out to the external shell,in the water turbine it takes the form of finger like filament that stops at the center. Amazing isn't it???? It is exactly what Viktor told us all along. I never met the man since I was born the same year he died. I can only pray there is an after life and one day he will look down and find his dreams realized . A final post script, UFO's do exactly the same thing. They create a ring vortex by expansion plate induction at the dead center of a magnetic field. As the ring enlarges and cools in between the UFO's power plate it heats the plate by friction and de-magnetizes it. The ring then collapses and the plate re-magnetizes. This process extracts natural energy from the environment. That is an advanced form of Viktor's "REPULSINE" . It requires a strong magnetic field in combination with a cooling vortex ring to magnetize the hull and induce still more updraft as if the hull was a large transformer. The noise is very distinctive as this plate is magnetized and de-magnetized by internal vortex rings(discovered by Schauberger). It sounds like a giant spring being compressed and then released (BOING,BOING,BOING). That is because pyromagnetic atmospheric energy extraction uses a counter spring to push the de-magnetized power plate away. Viktor Schauberger paved the way he showed us how to extract energy from a cooling vortex. That is the basis of all modern UFO power systems. Its all in the cooling vortex and its ability to be harnessed as high velocity wind friction source. The physics is so simple a high school science student could grasp it. The ring inside Viktor's implosion motor is hot on the inside and cold on the outside. that is why it contracts so violently. The vortex in the HILSCH-RANKINE TUBE is the exact opposite. The H-R tube uses mechanical energy from compressed air to create one of these vortex strands as its core expands it cools and heat goes to the outer shell of the H-R tube do to wall friction and compression. . We use just the opposite of this effect to turn a warm air core vortex with a cold external core into compressed air as the vortex collapses. Repeat the process is reversed. The H-R tube expands air by slowing the incoming air flow. That requires mechanical work from the compressed air source. It takes mechanical energy to pull air at its center apart by vacuum induction. The Schauberger implosion motor vortex package is warm at its center and cold at its out side and therefore contracts forming a small ribbon of compressed air that heats the hull. So all Viktor did was use a Hilsch-Rankine tube in reverse!!!! Instead of wasting compressed air he actually generated it. Compressed air then drives the upper exhaust turbine!!! and heats the hull. Brilliant and leading us into the energy future. There is no free energy here, only simple thermodynamics....and hot and cold atmospheric convection flows....That is how he did it..... GOOD LUCK TO YOU ALL!!! Sir, allow me to finish my remarks on "REPULSINE" construction and operation. As I have said before I must be careful not to put a dangerous instrument in the hands of an inexperienced "REPULSINE" experimenter. I have no desire to confuse this research body . My basic problem is in the fact that very few people have the industrial skill or mechanical engineering background to safely construct and test a "REPULSINE" That is not arrogance on my part we do not allow the general public to wander into a petroleum refinery or camp next to a power substation and roast marshmallows on a megawatt level step-down transformer. Allright!!! this is what can happen. One the "REPULSINE" will shed its upper power turbine! that turbine spins at a very high rpm and can if formed from cast metal shatter without warning. Two the internal thermal zone separator (wavy discs) and mechanical fluid work transmitter can shatter,it is hollow (I will explain) and flexible and is also not capable of with standing high centrifugal stress do to its "PERFORATED" construction and wavy design, it generally will shatter first. Four, the "REPULSINE" is capable of high temperature's (I will explain) it can scorch and burn its surroundings or a careless researcher. That temperature can easily reach 300 to 500 degrees F.
Five, the Repulsine can "EXPLODE" if its internal vortex is allowed to suddenly be quenched venting super heated air onto any nearby observers. Six, the "REPULSINE" must be grounded . It is best operated over hot pavement(I will explain). There is no simple way to describe its power level. It is cyclic and similar to a child's top being spun faster and faster. It can by a very strong suction force(as it sits in the middle of a much larger external vortex) be wrenched from the ground. Seven, the "REPULSINE" can effect the external environment it is highly recommended any researcher using it proceed to an area with "NO" air or automobile traffic.Eight, and this adds to four it can set fire to any dry brush present,it must be operated in a rock quarry or concrete industrial area for maximum fire safety with a fire extinguisher standing by. Nine, it is difficult to gain the approval of a mechanical engineer with an unproved technology, however he or she can still verify that every precaution has been taken. The vessel is subject to high internal winds approaching 100 to 300 mph!!! never underestimate the harm that wind can do!!!! That can amount to several static pounds per square inch. It is the escaping wind that is most dangerous. Ten, as air is ionized around the "REPULSINE" it can produce dangerous electrical phenomena. that is do to dust particle charging, anytime air passes a chamber that is not grounded at high speed it can induce charge particles the same way the Kelvin water drop experiment or grain silo can!! !Be prepared for static electric build up if operating in a dry environment. I cannot and will not be held responsible for any injuries received during experimentation on my Schauberger prototypes!!! This work has been done in private and without funding . I have had to improvise at many levels. It is far easier if the researcher has an industrial laboratory and the assistance of a safety engineer. That is all the further warning I will give here.Keep in mind you are about to construct an un tested(each new unit) and engineer certified centrifugal compressor vessel of un predictable power levels. A small "REPULSINE" can easily produce 10 to 25 horsepower, a large one in the ten to twenty foot diameter range well into the thousands of horsepower.This do to its power concentrating effect. It is in a category of windmills known as "DYNAMIC FLOW ENHANCERS". that is to say its passive wind flow ratting is small and no more then any similar Darrius or Savonious type. However once the work function has begun it can concentrate external flow from 2 to 10 to one. That is it will generate the equivalent power level of a machine ten times its own size. This is similar to windmills of the "diffusion cone" type.That refers specifically to a windmill that has a large external diffuser or cone that assists in flow pressure concentration allowing even a small turbine to generate far more then its diameter is capable of without the added diffusion cone to create a down wind low pressure pocket. Viktor wanted this top cone to be shaped like an elongated snail. This is so external wind in the form of dust devil can enter the cone and assist the upper drive turbine's rotation . I have found it best to use materials similar to the steel chimney pipes found in wood stove connection joints. That is a light steel sheet formed into a cone and riveted so that there is no turbulence on the inside of this upper chimney cone. That is the "EASIEST" part to fabricate. The taller the better. It should have at least twice to 5 times the height of the "REPULSINE PRIMARY PLENUM" its upper outlet diameter is still debatable. I recommend looking at Schauberger's water turbine arms and using that as a conical ratio. If the upper chimney is overly restricted by a small aperture ,the flow will quench,if an oversized exit hole , the flow will receive to much horizontal ground wind turbulence back flow. The dynamics problem of horizontal flow as it interferes with vertical convection flow produced by your "REPULSINE" can not be underestimated. That is the bane of all wind generator engineers who have attempted to produce energy by concentrating convection flow. That is, the horizontal wind will antagonize your "REPULSINE" unless it has its upper cone intake aperture or "SNAIL SHELL MOUTH" directly pointed into the apparent horizontal wind. Wind is variable ,it can change direction without warning so keeping the upper snail shell pointed can be a frustrating chore. You cannot place a guidance fin to keep the snail shell mouth pointed since that will break up the induced flow of the external dust devil vortex. Viktor simply ignored the snail shell all together and only punched a few inlet and outlet holes in a simple conic upper chimney shell. That is not to say it is un important. He simply could not get the correct shape fabricated. 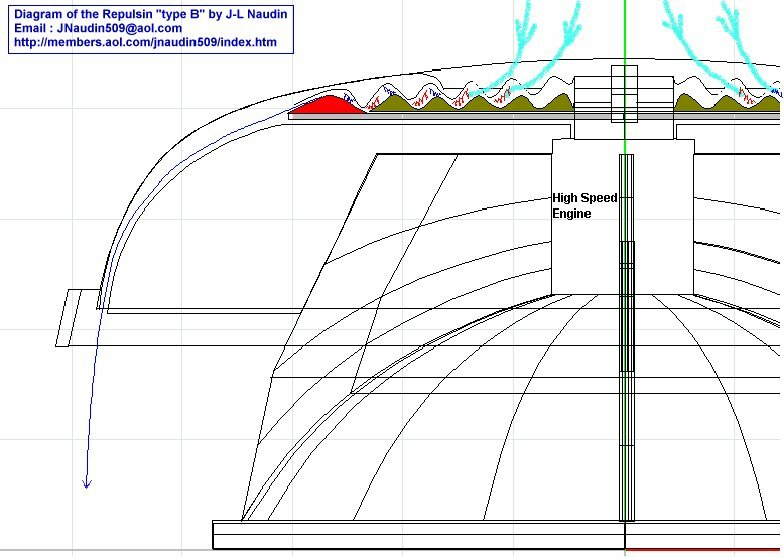 The upper chimney focuses the exhaust vortex leaving the "REPULSINE" drive turbine. Now you have the fabrication of the upper drive turbine. That turbine must be mounted on a shaft if using a 22 inch "REPULSINE" capable of at least 10 horsepower minimal load. ..Shafts of this type are found on all small engine's in that horsepower range and is a simple consideration. THICKER IS BETTER!!! 3/4 to even one inch diameter will ensure maximum safety. Obviously the bearing must be of a reliable type. I recommend from personal experience the bearings used in racing go carts wheel shafts. They have a 3 bolt mounting cup and are very reliable. That is fairly obvious to any one building a "REPULSINE".........REMEMBER this plate CANNOT!!! be constructed from plastics. IT WILL MELT!!! I realize plastic is safer and easier to fabricate. It is also worthless in a "REPULSINE" exhaust turbine. Next you require the "REPULSINE" shell. That shell is in my design fabricated from a 22 inch diameter Barbecue Kettle lid piece, it has a flat region that is cut out for the upper exhaust hole. I cut a hole in it years ago for a vandegraff generator globe in the 12 inch insulation tube diameter range. The exact plenum exhaust hole size on a "REPULSINE" is critical!!! once again if it is too large the shell heat wont build to a high temperature, too small and it will vent waste centrifugal air poorly and shut down the "REPULSINE" use Viktor's photos!!! My exhaust hole is 12 inches in diameter with a 22 inch plenum shell. I am still experimenting on the best diameter exhaust turbine. The " REPULSINE" has need of two active parts. The upper exhaust turbine or reversed centrifuge blower plate and the inner wavy discs that use the mechanical work from the upper turbine. Theses discs are not easy to fabricate. The best material I can find is used in fireplace screening and "PERFORATED". You must locate a source of perforated steel . That perforation is to allow air flow through the wavy discs, which also prevents back conduction of heat from the outer shell or rim region(I will explain).It will be found that Hammel, used a perforated metal cone on his devices. That is the type of shell you are after. If you are desperate you can perforate a steel garbage can lid. That is the lids are mounted one facing the other so that the cones oppose each other. Perforating steel sheet of that thickness with thousands of holes is difficult and imprecise. If you place too many perforations in one area the disc may shatter!!!!! Think of the drive exhaust turbine as a simple windmill. It is powered by updrafts and convection currents. It is also driven off of any horizontal flow that is swirled into the upper chimney shell snail shell mouth. That is all it does !!!! it uses waste exhaust to spin that is given maximum pressure advantage from the suction above it in the upper chimney shell vortex. There are "THREE" vortex's at work here!!! One is the external shell heat vortex or outer dust devil, Two is the vortex in the upper snail shaped chimney shell,Three is the mechanical work vortex inside the "REPULSINE" plenum or H-R tube vortex. The experimenter "MUST" examine carefully work done by vortex wind engineers on the web. THE ENTIRE UPPER PART OF THE "REPULSINE" IS ALREADY USED AT DOZENS OF WIND ENERGY SIGHTS!!!! Assuming you have successfully fabricated the exhaust turbine and mounted it in a typical tri arm mount flush with your plenum shell and mounted the two opposed perforated wavy discs on the long drive shaft. You now require a base shell. This shell must be as strong or stronger then the upper shell. It can be flat an still function. If it is flat steel it must be reinforced. It is always best to use shaped steel that is self integrated structurally do to its own 3 dimensional form,for example it can also have a wave ring shape. That is far more rigid then a simple flat piece.That is yet another reason the wavy discs are curved so that they are rigid when the "REPULSINE" tilts or lifts. This is then bolted and sealed to the upper shell. That is critical. The outer rim is subject to great pressure and heat.The bottom hole is smaller then the exhaust hole however the relative surface area is comparable. That is because a great deal of the upper exhaust turbine plate is sealed with only a small exit region open at its circumference. The bottom shaft bearing can be tri-arm mounted as well. These hole sizes are critical if the bottom axle area "INTAKE" hole is too small it will not intake enough air!!! The exact diameter as compares to the upper exhaust hole is still a matter of experimentation by me. It is between 4 and 6 inches in diameter. In other words its diameter in surface area approximates the exhaust outlet surface area. The entire assembly is best placed on yet another Barbecue Kettle piece!! The bottom hemisphere. In this use it is placed round side up (that is its rim on the ground). Several metal posts now go to your bottom "REPULSINE" plenum. The plenum or H-R work chamber is mounted 6 to 12 inches above the inverted kettle hemisphere. Those posts will later have metal fins on them twisted to guide air into the single intake hole concentric with the drive shaft. Now with all in place you can do a first spin test. I use a simple method,instead of an attached motor you can use the pressure exhaust of a large tank type vacuum cleaner. It requires precise aim . Place the hose near the "EXHAUST" turbine and push air against the curved blades the same direction the air is meant to leave the plenum chamber. This is a simple reaction effect. the snail shell hole is more then large enough for you to place the start up air jet. Recall model pulse jets were actually started with a bicycle pump!!! Now your "REPULSINE" is spinning!!! what happens next. Usually very little.. It will spin of course but until the exact exhaust ratio and intake ratio is found expect no miracles. The bearing races must be low friction. If you do it correctly the "REPULSINE" will begin to heat up at its plenum shell circumference.WHY???? That is because air is being spun by the internal wavy perforated discs and compresses on the shell rim centrifugally. That can be seen directly by touching the top of any large tank vacuum cleaner with a metal flange head. In fact all centrifugal air compressors or high pressure fans heat in this manner. Inside the plenum the air is being separated into a center or axle region cold zone and outer rim region hot zone. Mechanical work from the upper exhaust disc is being used to separate these temperature regions. this effect is no different then is seen on the H-R tube!! !The only difference is that air is being spun on the "REPULSINE" by frictional interaction with the wavy disc set,in the H-R tube it is from the mechanical energy released as compressed air is swirled into a vortex tube. The exact same thermal separation occurs!!! The inner region is cold and outer region is hot... That heat now contributes to a rising updraft vortex about the "REPULSINE",recall in a calorimeter experiment paddles are spun to heat water in a closed shell . One experiment is to then spray water at various temperatures into the shell. If it is done properly it will assist in imploding the center cold air mass and greatly increasing the R.P.M. of the turbine. This is a science experiment for a life time. Why does it work??? as the work being done on the "REPULSINE" internal plenum increases from the exhaust turbine drive shaft, the steel shell reaches a critical temperature level. At that point the rim air approaches several hundred degrees. The wavy discs prevent heat from easily moving from the rim to the center(that is one reason they are perforated and cannot be solid) . The plenum will begin to alternately heat and cool as new air is drawn in at its base. If its core air trapped in between the wavy discs is cooled the plenum velocity will increase. If it is heated by intake air the velocity will slow. This effect is resonant and typical of "REPULSINE" operation. It is very hard to explain. THAT IS WHERE VIKTOR AND I DISAGREE IN DESIGN THEORY.I refer only to a historical research note argument. I directly use this variable temperature difference to run a pyromagnetic air compressor. Viktor claims , that any time you allow the core air of his Repulsine to heat and expand it pulls the internal vortex wider apart!!! Next as you intake cooler air it snaps back together again. THIS IS A PHENOMENA OF THERMO MECHANICAL RESONANCE. Tesla coils use the very same principle. The point is that your plenum will be driven off of induced external updrafts (as if a campfire) AND off of a resonance caused by changes in the core vortex temperature!!! That is to say the plenum chamber is like a "CHILD'S TOP" any temperature change will cause the internal vortex(a vertical axis vortex centered about the drive axle) to expand and contract. The temperature changes must work in resonant fashion. Think of the child's top being spun faster and faster, as they plunge its push rod up and down...IT IS NO DIFFERENT!!! This resonant expanding and contracting vortex bounces off the wavy rings much as ball bounces on a floor. Each time a little more energy is added . It is like stretching and contracting a rubber band around your fingers. When thermal mechanical vortex resonance is achieved!!! the implosion motor takes off!!!! I am still experimenting with ways to insure this resonance. The easiest method is to forcefully spray cold water into the plenum chamber disc in synchronization with the "CONTRACTION CYCLE" ,that is when the vortex is shrinking in diameter. ONE FINAL TIME.!!! THIS IS NOT JUST AN OUT DATED CENTRIFUGAL AIR COMPRESSOR!!! IT IS A CHAMBER WHERE ANY INTAKE AIR IS BEING CONVERTED INTO ROTARY MOTION!!! ALLOW ME TO EXPLAIN THIS A FINAL TIME!!! AS THE AIR VORTEX ENLARGES IT STRIKES THE RIM AND COOLS, THIS CAUSES IT TO BOUNCE AND RETURN LIKE A WAVE TO THE CENTER OF CHAMBER (MUCH LIKE AN ECHO) THIS COMPRESSES THE CENTER COLD AIR AND HEATS IT,CAUSING THE WAVE FRONT TO ONCE MORE EXPAND.. THAT!!!! is why the wavy perforated discs are so important. THEY GUIDE THIS ECHOING VORTEX BAND AS IT BOUNCES FROM RIM TO CENTER AND BACK AGAIN!!!! To see what Schauberger saw go to a circular water bath or tank(it must be a perfect circle). put a Styrofoam disc at its center with a stick attached. START TO RESONANTLY PLUNGE THE DISC UP AND DOWN. IF YOU TIME IT RIGHT THE WAVE CREST WILL WORK WITH YOUR PLUNGE'S IN HARMONY,AS IT BOUNCES OFF THE TANK WALL. THAT IS EXACTLY WHY THOSE DISCS ARE WAVY AND PERFORATED!!!!!! THEY ALLOW THESE VORTEX BOUNCES TO BUILD UP ENERGY. Yes. you can argue that wastes power. Actually it does not,the heat leaving the rim feeds back into the exhaust turbine updraft. YOU ARE AMPLIFYING THIS ECHO EFFECT!!!! Now the skeptic ( and God love them all ) will begin to squirm in their seat in the lecture hall. What good is this resonance effect. Sure a Tesla coil makes a big spark, but that uses up electrical power even at high Q. WHAT MAKES A TWO CYCLE MOTORCYCLE EXHAUST PIPE WORK??? in motorcross racing we call it an expansion chamber. ECHO!!! That is correct the principle that helps back pressure a two cycle motorcycle engine is the EXACT same principle that feeds back energy in a Schauberger "REPULSINE" implosion motor. IT IS NO DIFFERENT. THE SKEPTIC STANDS AND SAYS THERE IS NO GASOLINE BEING COMBUSTED HERE!!! WHAT DIFFERENCE DOES IT MAKE??? WE MY FRIEND ALTERNATELY CAN SPRAY COLD WATER AT THE ECHOING WAVE FRONT AND ACCOMPLISH THE SAME THING AS A GASOLINE ENGINE!!!!! It makes no difference . We can get mechanical work either way!!!! a Stirling engine obtains mechanical work on both its cold cycle and hot cycle!!!!! We now have two defined reservoirs. A cold rim reservoir and a hot central intake reservoir . These reservoirs are maintained by external wind and sunlight. THIS IS NOT A GUESS IT IS A FACT!!! A Stirling engine uses a displacer to shuttle an air mass between a hot and cold reservoir!!! Go to the fine Japanese Stirling engine page and you will soon understand this principle. In the "REPULSINE" this is accomplished by the natural vortex echo inside the chamber. This echo builds up our R.P.M.... A final time!!! that is why the wavy discs are perforated they must help spin the vortex but never stop its wave front echo!!! Think of that as a natural air displacer .Striking the rim cools the vortex and reaching the center heats it . The center bottom is hot from intake air ramming.... Think of it this way before you stop reading this material. The echo bounce places our vortex over the center and then the rim region. That takes the place of the Stirling engine displacer!!!! The vortex acts like a "FLYWHEEL" that stores the bounce energy. In effect it is a simple Stirling engine hybrid that uses the expanding and contracting vortex as both a piston and a displacer at the same time. In a previous writing I indicated a smoke ring was used instead of a vertical axis vortex. That is still debatable scientifically. I feel the vertical drive axle centered vortex is the one of most concern not the smoke ring type in justifying my own experimental "REPULSINE" results. A final purpose of the wavy internal disc is to help bounce the vortex. It is similar to the 90 degree phase drive rod that activates the displacer. It forces the vortex wall back out to the rim. I realize that I said the rim is hot and it is. That is because it is constantly relieving itself of heat from the internal bouncing vortex.It is also cooled by the swirling external vortex. Without that it is no longer a useful reservoir...In effect we have discovered a "DYNAMIC FEEDBACK STIRLING ENGINE SUITED TO EXTRACTING ENERGY FROM A STATIONARY EXTERNAL TORNADIC CONVECTION CELL"
This is not free energy...but I feel it is neglected physics only time and a little faith in Schauberger's genius and commitment to relieving the suffering of mankind will tell....THANK YOU!!!! Sir you must realize this device has been a pet project for so many years that I am often forced to jumble dozens of different physical concepts(all of which are in mainstream science). This important warning adds to the list of others I have already given. When I attended a University in Texas, I was able to read in the library a marvelous series called "PHILLIPS TECHNICAL REVIEW"
In that review was illustrated and analyzed a 9 million electron volt air "BETATRON'. A standard Betatron uses a massive transformer iron inductor far beyond the construction technique of any home experimenter. Betatrons have now been superseded by linear accelerators for most applications. In the Phillips Technical review notes was found an "AIR CORE" Betatron containing only a few kilograms of active magnetic flux material. That is to say the Phillips engineers had found a way to avoid all of the heavy iron superstructure used on a Betatron. It relied instead like a Tesla coil on resonance in heavy cables. To add therefore to the list of things to avoid when constructing a "REPULSINE" I must now in all fairness add the "AIR CORE" Betatron effect. This means very simply your "REPULSINE" is capable of hard x-ray production from an internal current imploded with the thermo-mechanical rim resonance vortex bounce. To put it simply the REPULSINE at full resonance is a "RADIATION SOURCE" it is possible 50 thousand to 10 million electron volt level radiation by products in the form of hard x-rays will be present during operation..
BE FORE WARNED!!!! I studied Nuclear physics for most of my life. Any time you contract a charged electron cloud so that its magnetic field is cut you "CAN AND WILL ACCELERATE ELECTRONS IN THE DEFINED NATURE OF A BETATRON PARTICLE ACCELERATOR"!!!!! I have years of experience in that theory area. I was not allowed to construct my own Phillips air core Betatron do to safety concerns by my physics professors.I actually had a Doctor at Houston's own M.D. ANDERSON Betatron facility encourage me to test the effect. I had collected the high vacuum equipment and requisite conductor materials.. Fortunately my wise professors forbade its construction. I never worked with Nuclear energy again and became dedicated to finding safe non-radioactive energy sources. Well SIR!!! the "REPULSINE" ain't it.... It can and will emit high energy particle radiation of the class known as high energy electrons and hard x-rays. The Phillips "AIR CORE BETATRON" proves a large ferromagnetic induction mass is not required for electron volt energy levels up to 9 Mev. Prolonged X-ray exposure is a certified tissue destroying process. For those would be nuclear physicists out there any doubts that the REPULSINE is capable of Betatron particle acceleration will be quashed after reading about the Phillips T.R. papers on there 9 Mev "AIR CORE BETATRON"... BE VERY CAREFUL!!!!! The final piece of the puzzle . The "REPULSINE'S" rim is resonantly cooled by thermally induced down draft feed back as the internal plenum flow expands for its re-coil or implosion echo. It is a surface, effect hot internal centrifugal air induces a cold downdraft pulse,That is in effect the capacitive analogy to our thermomechanical vortex resonance taking place in the "REPULSINE" The cold air skin effect resonant pulse is the basis of all "UFO" type craft and is the actual power source. Hot always attracts cold ...remember that!!! The "REPULSINE" is unpredictable and dangerous and in an evacuated condition is capable of "HARD X-RAY PRODUCTION" ...It is "NOT" a toy. It is best left in the hands of certified engineers and physicists...GENTLEMEN YOU HAVE BEEN WARNED!!! !